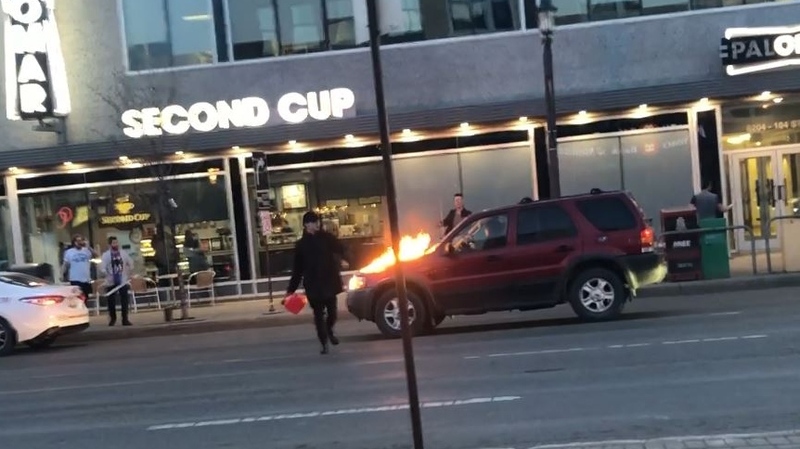 Edmontonians enjoying patio weather near Whyte Avenue Friday night had many varied reactions to a man who set vehicles on fire as he walked by: some fled, others responsibly grabbed fire extinguishers, and two—hailed as heroes online—pinned the man down. Videos shared with CTV News and posted to Reddit show a man dressed in all black pouring gas on several vehicles and lighting them on fire. As he walks away, he throws the can and begins to run away into a Starbucks. One bystander, dubbed “Hawaiian shirt guy” on Twitter, chases him down and pins him inside the cafe. A man carrying a baseboard, nicknamed "2x4 guy," follows closely. At first, the pair closest to the commotion sits tight. Eventually they decide to move, and the woman leaves behind her drink. Police show up a few minutes later and arrest the man in black. Edmonton Police Service told CTV News no one was injured. Officers continue to investigate. “Hawaiian shirt guy” and the man equipped with the slab of wood were at the centre of attention on social media Saturday. Who are these dandy individuals who stepped up to stop this moron on Whyte?